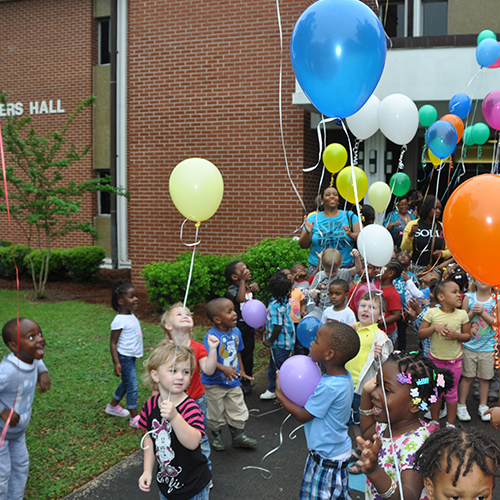 April 24, 2015 –Fort Valley State University’s Child Development Center and Head Start programs took part in a nationwide celebration that raises awareness about early care learning programs and its educators. The Week of the Young Child (April 13-17) is a program sponsored by the National Association for the Education of Young Children (NAYEC). NAYEC is an organization composed of early care learning educators and associates. Their main focus is improving the quality of early childhood programs for children from birth to age eight. Its membership boasts more than 80,000 and composes a network of more than 300 affiliates on the local, state and national levels. FVSU alumnus and Fort Valley city councilman Jimmy Barnes, jumpstarted the weeklong festivities by reading a proclamation. Other scheduled events for the week included show and tell sessions involving parents, computer classes in FVSU’s Mobile Information Technology Center (MITC), a parade down State University Drive and aerobics in the Health and Physical Education Complex on campus. FVSU’s Child Development Center and Head Start programs serve children in Peach, Taylor, Crisp, Macon and Dooly Counties. For more information about FVSU’s Child Development Center and Head Start programs, contact Fluellen at (478) 825-6236/6234 or fluellev@fvsu.edu.